Home » Bonus Content » Web Exclusive: South East Regional Aerotow 2016! Web Exclusive: South East Regional Aerotow 2016! Growing the sport of aero-towing one pilot at a time! Going north on I-75 in Georgia, just south of the home of the Perry Swap Meet is the town of Cordele. Wandering off the interstate and through the peanut fields that President Jimmy Carter made famous and well off the beaten path you can find yourself in Americus, Georgia. 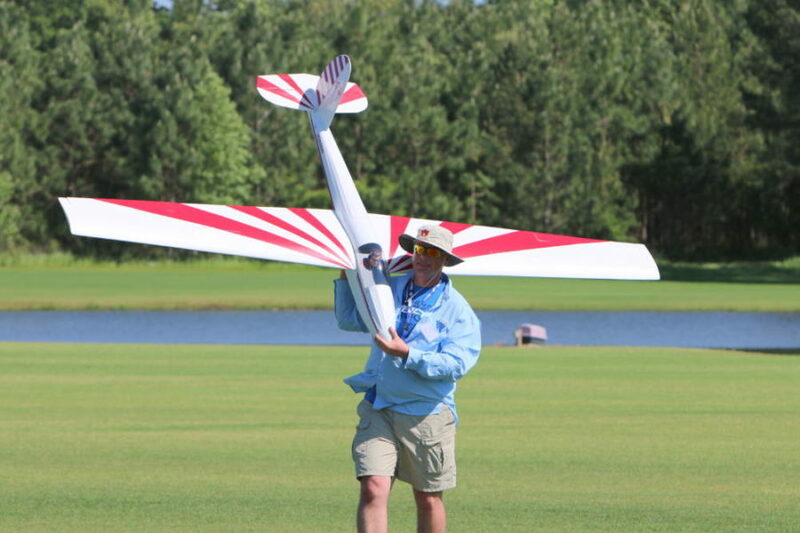 Peter George brings in his half scale Hempel K-6 in for a landing. Pete made lots of modifications and did a lot of scale detailing on this amazing model. Aviation fans may remember that in 1923 a young wing walker working at the Flying Circus right here in Jacksonville, Florida made his way to Americus with $500 in his pocket. War surplus Curtiss Jenny’s could be had on the cheap and this young man purchased one and asked the locals uncrate, assemble, and ready it for flight. After nearly wrecking the new Jenny on the ground, this young man, who only had a little bit of dual stick time but had never actually soloed, asked the fellow he purchased the plane from for some flight instruction. A few hours later he made his first solo flight at Souther Field in Americus, Georgia. It was another five years, and presumably a lot more stick time later, that Charles Lindbergh etched his name permanently into the history books but few know that it all started right down the street from one of the best RC flying fields to be found anywhere in the country. Late in 2014 the three founders of SERA, Asher Carmichael from Huntsville, AL, Kris Van Nostran from Melbourne, FL., and myself, spent a considerable amount of time cavorting to find a venue to launch what we envisioned to become the premier aero-tow event in the south. Much discussion ensued about not only finding “a place to fly”, but finding “the right place to fly”. This is me feeling particularly cool after Jeremy Hartman from The Model Box in Hoover, Alabama let me fly his Top Models Pilatus Porter with a turbo prop engine. 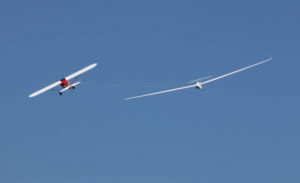 The folks flying big scale sailplanes like a lot of room, preferably free of glider snatching trees, annoying power lines and other obstructions. Grass would be the preferred runway to save wear and tear on the models, and the icing on the cake would be a hangar or shed to store the large planes fully assembled so that they wouldn’t have to be broken down at the end of each day. Also a geographically centralized location to minimize long drives to attract as many pilots as possible would be ideal. After evaluating the suitability of and discarding several possible locations, I threw my idea out for consideration. Just a few miles outside the town of Americus, Georgia. practically within sight of Souther Field (see sidebar), sits just such a heaping slice of RC nirvana. It used to be known as Hodges Hobbies but just over a year ago Mac Hodges, much to the chagrin of RC modelers everywhere, decided it was time to retire. The world class hobby shop was shut down but the RC field, known now as Hodges Field, remains active. 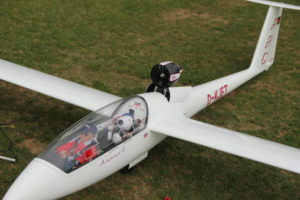 Hodges Field is the venue for many events, one of which is SEFF (the Southeast Electric Flight Festival), which attracts somewhere in the neighborhood of 400 to 500 pilots plus spectators and family, is easily the most widely known. 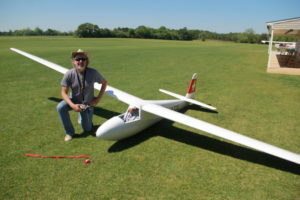 Peter George of St Louis, MO with his half scale Hempel K-6 that spans 7.5 meters, if you can’t do that conversion in your head that’s a 25 foot wingspan. Despite the size and weight, it flies amazingly slow and can get towed up by a 120 size tow plane. Hodges hosts a lot of events but to my knowledge they had never hosted a glider event and certainly not an aero-tow. Thus many in the glider community were unfamiliar with the outstanding facilities to be found at Hodges including a large covered pit area with power for charging batteries, power and water hookups for campers, and of course, the field. Ooooh the field. The 1500 feet long runway is over 300 feet wide runway and irrigated, cut with a rotary finishing mower, and rolled to perfection. As an added bonus, Hodges is only about 15 minutes from town so a variety of shopping and dining establishments and relatively inexpensive hotels are close at hand. Christian Luginger from Greer, South Carolina had a really neat assortment of planes including this Arcus with a deployable EDF. The truth of the matter is that the place is hard to adequately describe but Asher and Kris spent some time on Google Earth and agreed that there was plenty of room so it was unanimous that we would give it a try. 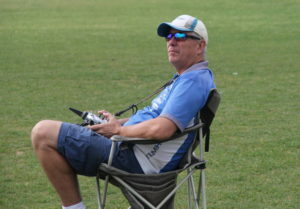 April 2015 Hodges Field hosted the first ever South East Regional Aero-tow. Turnout was modest, we had 15 or 16 pilots, but all of the first time visitors to Hodges were convinced, this was the place to hold an event with plenty of room to grow and word started to filter out. After the 2015 event we got together and firmly agreed to go forward with the 2016 event and got an early jump on planning. The event was sanctioned early which meant three months advertising in the AMA event listings both online and in the magazine. 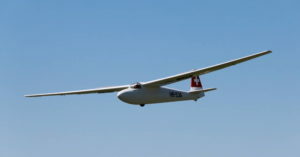 Extensive use of social media such as using the Facebook event feature, as well as maximum exposure on the only web site exclusively dedicated to aero-towing, ScaleSoaring.com, meant we reached a lot of potential aero-tow pilots. Pete Goldsmiths pilot is taking a break and getting some of the plentiful Georgia sun. 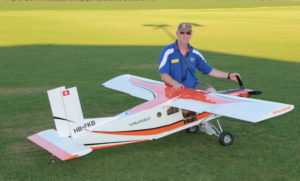 The Horizon Hobby Aero-tow in Monticello, IL, is the largest in the country and they average 50 plus pilots and having an event of similar scope is what we are hoping to grow into. While we didn’t reach the numbers of the well-established Horizon event we managed to double our participation from the previous year and attract 30 glider and tow plane pilots! We also tweaked the dates to land after SEFF and this year’s participation was bolstered by a week of awesome weather. True, rain came in Friday but it came in right at noon and lasted less than two hours while everyone was under the awning eating lunch, chatting, and hanging out. It didn’t hurt that Asher had the grill going for lunch each day so there was no reason to leave and head out to town for lunch. If you had the chance to read Steve Mills great article covering SEFF you probably know that they dried out all the rain clouds to pave the way for our great weather. 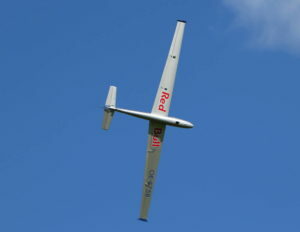 Peter Goldsmith stopped in to fly with us on his way to Top Gun the following weekend. The relaxation must have done him good, he won it all at Top Gun! 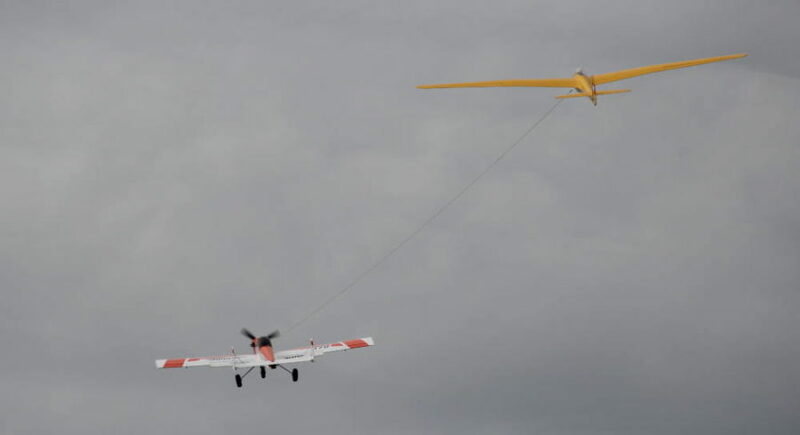 One thing I want to covey to new and or perspective aero-tow pilots is the attitude that giant scale glider pilots are big proponents of sharing their love for and spreading the sport of scale aero-towing. Egos are checked at the gate and everyone helps everyone no matter if they are flying an 8-meter glider that costs thousands of dollars or a Parkzone K-8 foamy. or tow plane setup and techniques. After all, aero-towing is unique in that done wrong you not only have one airplane at risk but two! I will admit that it can be intimidating to pull into an event with a foam Cularis or a Carbon-Z Cub and see a bunch of 100 plus inch tow planes lined up waiting to tow up an array of kit and scratch built masterpieces. Thus, I was particularly delighted to see an entire flight line spring up off to the side that was devoted to smaller electric tugs towing up a variety of small foam and built up gliders. The smiles on everyone’s slightly sunburnt faces and the chat over dinner was the same no matter what anyone was flying. Like most events, it wasn’t all about the glider flying during the day either. The fire pit was going and night flying with several Pawnee Brave night flyer models went well into the night. Turning off the outside lights, the stars in the back country of Georgia are something you just don’t see near any city or even many towns due to the light pollution. These times around the fire swapping stories are where lifelong friendships are made. 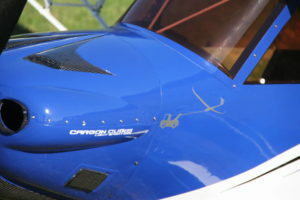 Any questions about what Tom Harper’s Aeroworks Carbon Cub is for? If you have any interest in learning more about this exciting aspect of our sport, head out to the Scale Soaring web site and check out the event listings, find an event near you, and head out to one. If there’s no events near you, there are several reasonably priced kits that will allow you to wade in with a few toes in the water rather than investing in large equipment. 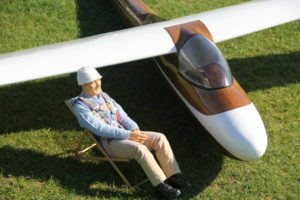 There’s several examples but the E-Flite Carbon-Z Cub and Parkzone K-8 glider come to mind. Both can be equipped with a tow line release without modification and they are foam so they are inexpensive and easy to fix if there’s a mishap. Marc Simmons made the trip from Oviedo, Florida and did a lot of towing with his Hangar-9 33 percent Piper Pawnee. 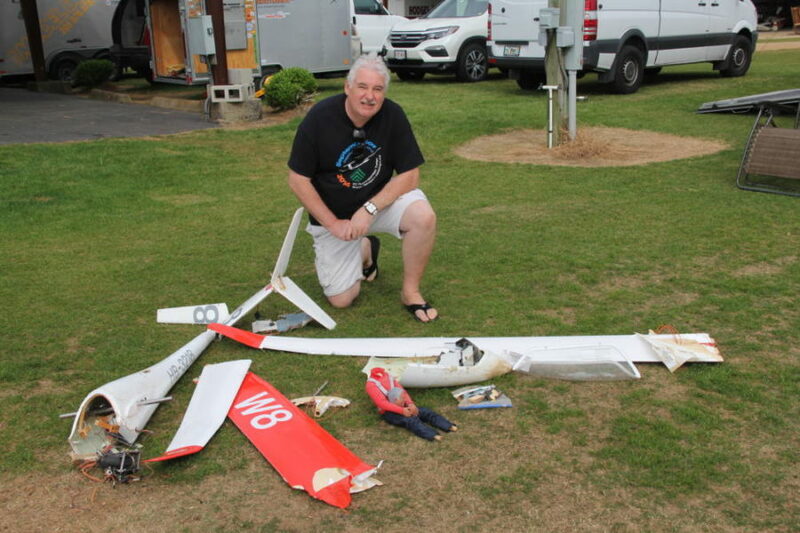 Unfortunately this is what a few thousand in scale glider can look like if the main wing spar fails, but Jeremy Hartman had a good sense of humor about it and was back at it quickly. 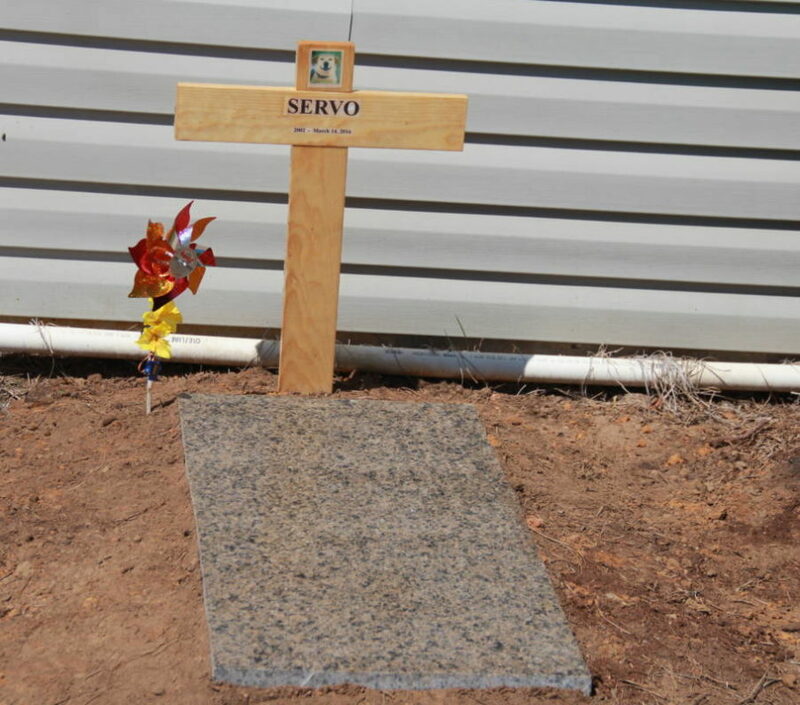 No visitor to Hodges Hobbies or Hodges Field ever went without getting to know the coolest dog on the planet; Servo. Unfortunately, he passed away recently. John Mears from Birmingham, AL, having his unique looking 1950’s style Mosey 4 towed aloft by Scot Stewart’s Bidule tow plane. 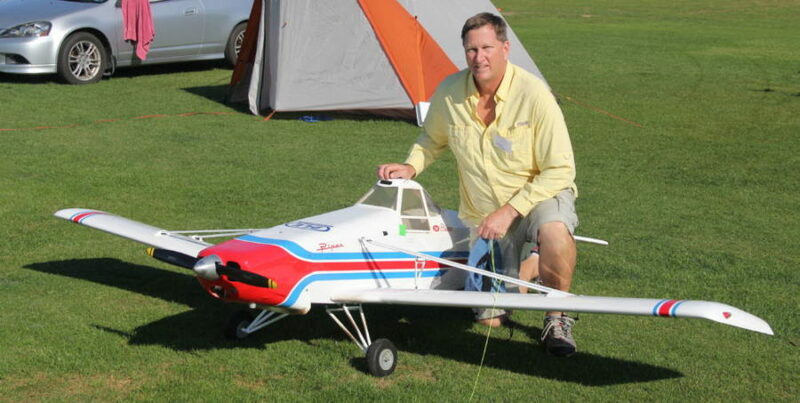 Andy Grouse from Tanner, AL with his ¼ scale Schweitzer 1-26, Andy also spent a lot of time towing with his E-Flite Carbon-Z cub on the electric/foamy flight line.